As we sip our very own Buffalo Trace Single Barrel Bourbon, I thought it would be a good time to recall one of our other favorites Bourbons from Buffalo Trace: Weller. Depending on the release, it's referred to as William Larue Weller, W.L. Weller, or just Weller, and named after a Kentucky distiller from the nineteenth century. All Wellers are wheated bourbons, meaning that the secondary ingredient after corn, is wheat, and not rye which is more common. 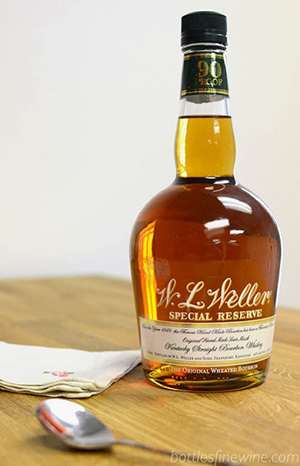 Weller is another brand in Buffalo Trace's large portfolio, and while there are many brands, there are only four main recipes, or mashbills as they are called in the Bourbon world. See the Bourbonr's infographic for more information on what brand has what recipe. What other wheated bourbons are out there? Pappy Van Winkle (cough cough) comes to mind, and it's made at the same distillery from the same mashbill. Weller bourbons are close enough to the Pappy Van Winkle line to have been famously called Poor Man's Pappy, but cost significantly less if you can find them. I'm not going to call Weller Special reserve a consolation prize, as it's fine wheated bourbon, but Marcus Lemonis from CNBC's The Profit would call this the entry level product in the Weller product ladder. It's probably more akin to a BMW 3 series than an econobox, in that people will buy it and love it, but wish they have the M3 or 5 series instead. You're probably going to like this bourbon, but not as much once you taste the others. Can you find it? Yes, sometimes, though not as much as you would think for an entry level spirit. Rarity: Sometimes findable, sometimes not. 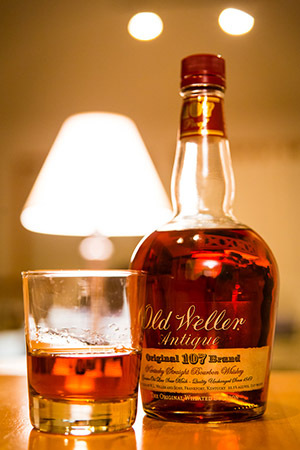 The Old Weller Antique 107 is a fantastic, near cask strength bourbon. 107 is the proof (53.5% alcohol) of this bottling, and the extra punch really amplifies the greatness of the "regular" strength Weller Special Reserve. It's got a luxurious mouthfeel that results in a smooth sipper, even while being relatively young as far as bourbons are concerned. The extra proof and relatively low price make this a great cocktail spirit as well. Can you find it? Yes! I've seen this on more restaurant and bar menus than probably any other Weller, and because restaurants are usually paying retail price, drams are inexpensive. It's harder to find a bottle at a retail shop, but not that hard. It's one of those spirits that you ask for at a popular liquor store and they tell you they're sold out, but then you find a bunch of bottles gathering dust at a random grocery store. My policy is to always have one or two bottles at home, but never to stock up on it, as it always seems to turn up when I need another bottle. Rarity: Findable at restaurants, sometimes at stores. The W.L. 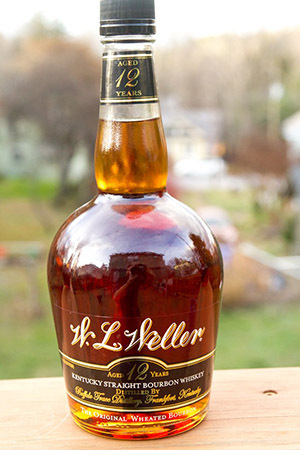 Weller 12 Year Old is probably the closest you'll get to the luxury of Pappy at regular ol' bourbon prices. It's not cask strength, but the age is right and the barrel selection is top notch. It's as easy and enjoyable to drink as anything, ever, but never boring. You'll drink this and wonder why you've spent so much time and money seeking out other bourbons. The reality though in 2016 is that this is pretty hard to find, though it probably shouldn't be. It's arrival is usually once a year at places that do get it, and bottles don't last long. Our members have found it at higher-end grocery stores and some liquor stores, and almost always buy it when they see it. Unlike the Antique 107, it doesn't seem to reappear when you finish a bottle. Bigger stores around the country that do online sales rarely have it either. Your best bet to taste it is at a restaurant or high-end bar. To get a bottle, be patient, resourceful, or preferably both. The Seattle Spirits Society tasted this officially at Mtg No. 27 and it immediately shot up to the top of our best value list. Cost: $25-$50, and even $100 once, with the higher prices being charged by retailers wise to the demand for it. 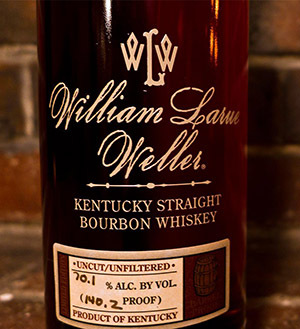 William Larue Weller is the top of the line Weller, and part of the lauded Buffalo Trace Antique Collection or BTAC as it is known. Right now, the William Larue Weller and the George T. Stagg are probably the hardest to find bottles in the BTAC due to both of them continually topping best whiskey/bourbon ratings and awards every year. Let's just set expectations: you won't walk into a liquor store and find this sitting on a shelf for its retail price of $80. If you're lucky, you'll see this locked behind glass for $600, but you probably won't see it at all. This isn't a bottle for a special occasion, this is a special occasion in a bottle. Some online sellers will have this but at high enough prices to basically ignore their presence. Why is this so hard to find? You'll have to ask Buffalo Trace about that, but generally it's an example of the principle of supply and demand. Buffalo Trace publishes a fact sheet on this release, and while they leave out the exact number of bottles, the amount can be reverse engineered by looking at number of barrels and percent lost to evaporation. It looks like 7780 bottles (at most) for 2015, which isn't a lot considering Ardbeg's 2015 yearly committee release of Perpetuum was limited to 72,000 bottles. In 2014, the release of William Larue Weller had less than 4000 bottles. Going back to our BMW analogy, this is more like an early nineties BMW 850CSI, and I'm not referring to how one car magazine derided it by calling it a ninety thousand dollar paint job. This is top-of-the-line, serious, powerful, deep, and immensely enjoyable cask-strength juice from the top Bourbon maker in the world. Rarity: Findable at high-end whiskey bars that have other BTAC bottles, but not many other places. ABV: 60%-70%, as it changes with every yearly release. Age: 12 years for the 2015 release. Price: $80 retail price, but more like $400-$800 street price. If you're unable to find any of these Wellers at first, don't fret, I'm sure you'll find one eventually. In the meantime, you can try other wheaters like Maker's Mark, preferably the cask-strength version, or the easy to find Larceny Very Special Small Batch Bourbon.